with a Curly Bow on Top. 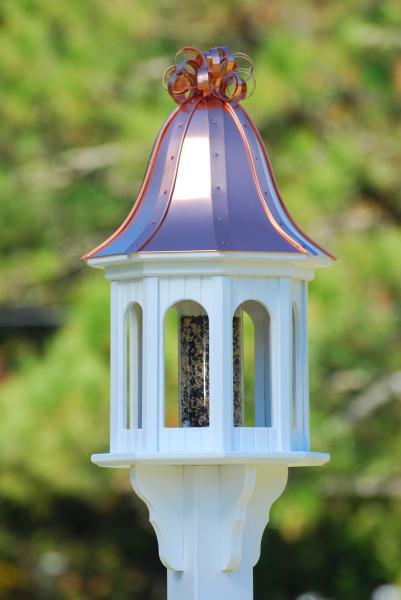 This work of art bird feeder features a large 5 inch diameter clear acrylic tube to hold bird seed and a unique curly copper roof accent top. Roof lifts off for easy cleaning and filling. This beautiful copper and vinyl white bird feeder will be the focal point of your yard guaranteed for a lifetime! OPTIONAL Vinyl square 4X4X72 Post SLEEVE available upon request for $60.00. NOTE:AVAILABLE ALSO IN PATINA ROOF AS WELL. PLEASE SPECIFY ON CHECKOUT.